The Full-Size series binder is one of our most universal binders custom designed for Logbook Pro. 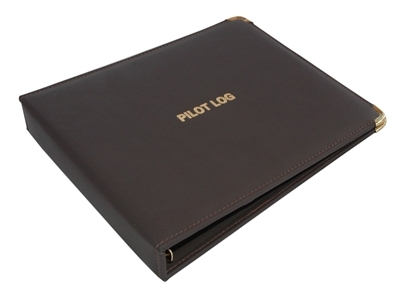 With the unique landscape layout and fine soft leather, this binder can handle any of the over 60 Logbook Pro reports and prepare you with the perfect printed solution with little to no effort at all. With the gold print on the fine leather and gold corner savers, this model stands out for its value and practical use. The gold rings are easy to use and hold more than the smaller models. The open book has pockets on each cover for storage of documents, fuel receipts, etc.